A light and refreshing lemon-flavored cheesecake made with ricotta and cream cheeses. This crust-less cheesecake is very easy to prepare. 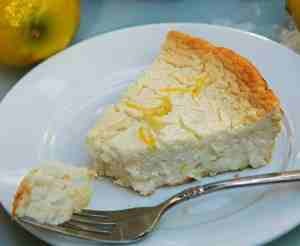 Here is an easy dessert recipe for Lemon Cheesecake. Combine ricotta cheese and cream cheese in a large bowl and beat until smooth. Add the eggs one at a time, beating well after each addition. Add the buttermilk, sugar, cornstarch and salt. Beat until smooth. Mix in vanilla extract, lemon juice and lemon rind. Pour mixture into a lightly buttered 9-inch springform pan. Bake for one hour. Cool completely before removing the rim and serving. Serve with fresh fruits, if desired.